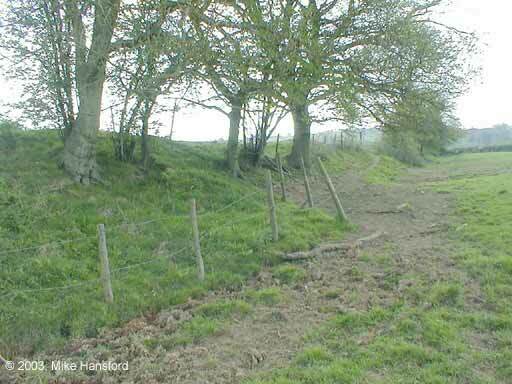 West Wansdyke most probably starts on Maes Knoll, with the bank and ditch originating from the eastern defences. 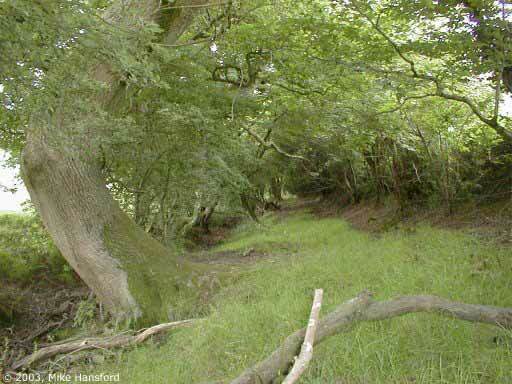 A sunken lane converges with it, and it must have been the original ditch, now eroded. The railroad obliterates the course of the dyke east of the little wood, but it re-emerges until it reaches Publow Brook, where Wansdyke ends for the first time. As you can see in the spread below, every field has a different manner in which Wansdyke is preserved, for in the third field (as can be seen from the panorama) Wansdyke is reduced to a former field division, while in the next field the ploughed-down bank reappears. In this spread, you can see that Wansdyke due east of the Whitchurch - Norton Malreward road, following the hedgerow to the little wood in the middle distance, where it is crossed by the former railroad. In the left corner lies Publow Hill. On this spot the bank and ditch are very visible and strongly marked on each side of the road. It can be assumed that the building in the late 19th century of the North Dorset railway destroyed much of this stretch, but earlier activities may have done so as well. East of the railway, Wansdyke reappears in full glory. 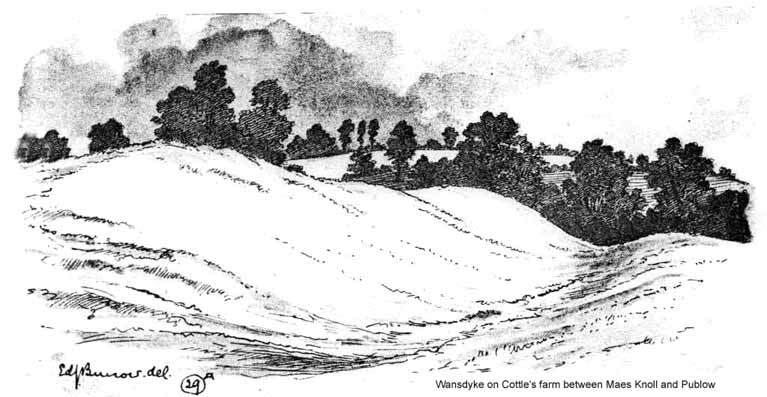 In the drawing from 1925 you can see Wansdyke on Cottle's farm between Maes Knoll and Publow (above). Wansdyke, interrupted only by a former stream-head, continues with a massive height all the way to the Publow brook. Here Wansdyke ends in the Publow Hill gap. This gap in the continuation of Wansdyke, although only 2,24 kilometres (1.4 miles) long, issomewhat of a mystery. 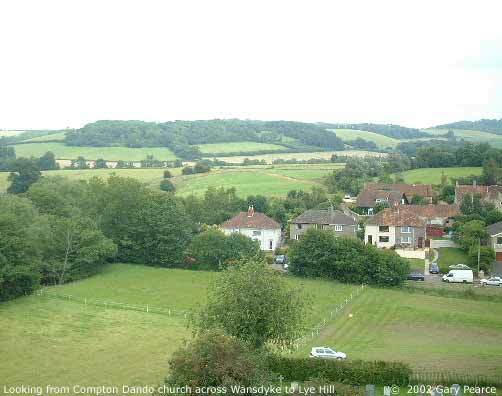 Not onlydid the alignment puzzle the researchers, the complete absence of any trace of Wansdyke over a not inconsiderable distance has led some of them to believe that Wansdyke could only have been constructed without any political control over the Avon valley. Strengthening this point of view was the apparent lack of any view to the north, which is limited to the valley of the Publow brook. Some authors sought to trace Wansdyke across Publow Hill, but in vain. Major & Borrow traced a dubious course, which is now seen as an apparent non-existing line of modern field-banks and hedgerows. 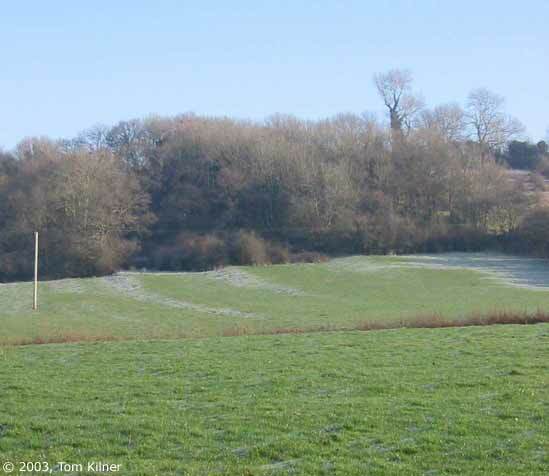 One of these can be seen in this picture, which shows frost-marks on wahat seem to be strip-lynchets, but what may have been remains of Wansdyke. 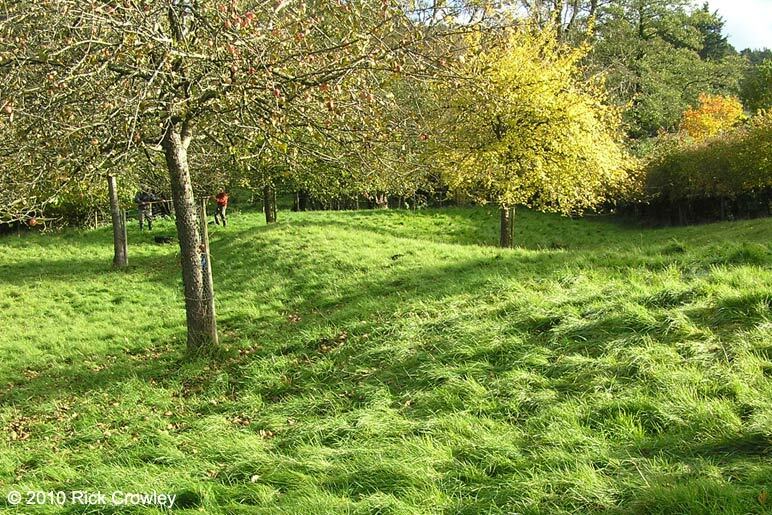 Many remains of planned earthworks turn out to be strip-lynchets, which belonged to a settlement that once existed on Publow Hill, maybe dating back even to Roman times. Crawford (hesitantly) favoured the river Chew and its tributary as a boundary, but Fox & Fox reasonably argued against that by showing that at Peppershells plantation, a portion of Wansdyke could indeed be traced north and west of the river, and which was missed by Crawford. Even Crawford mentioned that a 1811 Ordnance Survey map marked Wansdyke as running parallel to and north of the river Chew (of which he could find no trace before 1960). 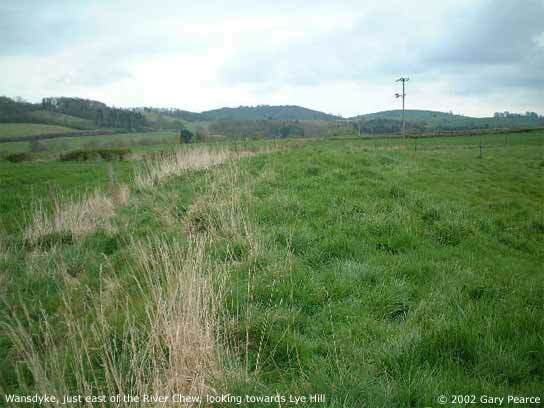 Indeed, traces of Wansdyke can no longer be found on the upland of Publow Hill, not even on air-photographs. As it is no longer present on the 1900 map, chances are that the early 19th-century surveyors made a mistake. 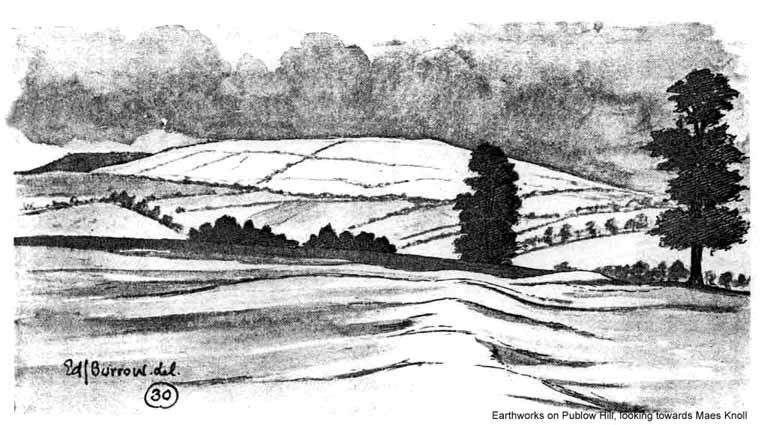 This drawing by Burrow in 1926 shows earthworks on Publow Hill, looking towards Maes Knoll, (click here to enlarge the drawing). What, then, could be the reason for a gap in Wansdyke of this magnitude? Fox & Fox have argued for a dense forest cover at the time of construction. This would make any defensive earthwork or indeed a token boundary dyke superfluous, and the authors argue that this is repeated elsewhere. Though I would not exclude this possibility, I would rather take the lost settlement into account, which would also provide a very good explanation for the absence of any remains. Furthermore, it could provide a reason why the builders seemed less caring about the lack of view northwards, which would of course have been provided from the settlement on top. There could have been a continuation at some time, of course. The 1900 map shows the remains of an east-west aligned bank just northwest of the summit of Publow Hill. 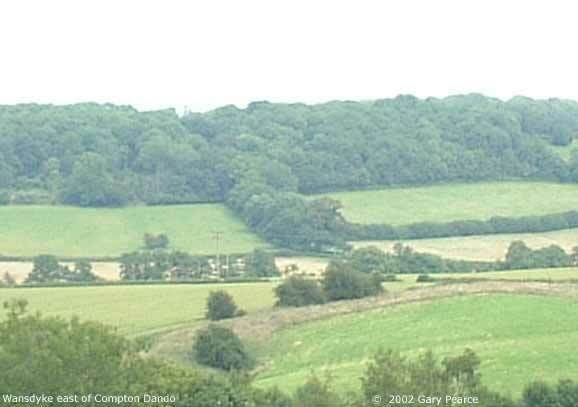 This would, if once continuous, have crossed the hill in a manner which would have allowed a view to the north, before following a ridge south of Wooscombe Bottom (along what is now the Whitchurch-Compton Dando road) to where it reappeared east of Knowle Farm. Major & Burrow traced it here, but only as a continuation of their incorrect reconstruction of Wansdyke across Publow Hill, and no solid evidence can be found today. A last remark on supposedly limited views from Wansdyke on this stretch. The alignment of Wansdyke between Maes Knoll and Stantonbury is in a near straight line, which means we can be almost certain that it was planned that way. 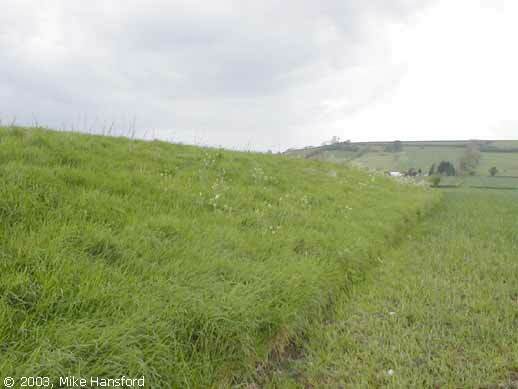 These two hillforts have a clear view towards each other, and surveyors must have used that fact. Similarly, both hillforts have a clear view, between the both of them, of all terrain north of Wansdyke. That some parts lack a view of the north towards the Avon valley is therefore negligible on a strategic level. 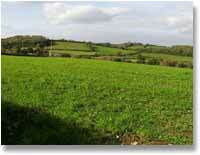 In 1830, Colt Hoare reported Wansdyke running from Knowle Farm to the river Chew. 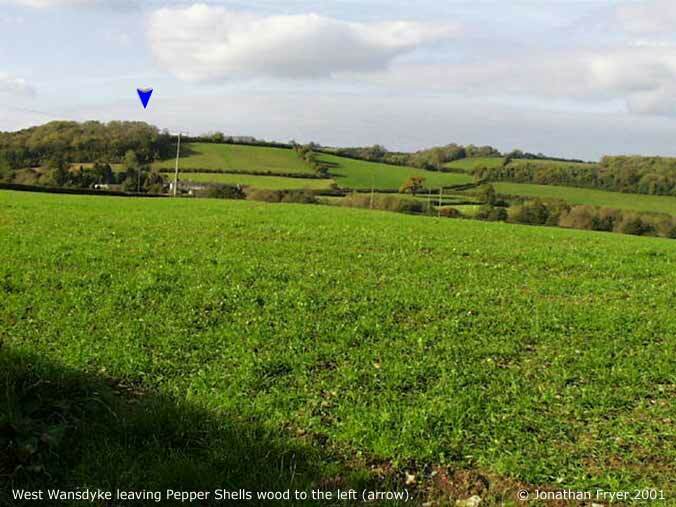 Fox & Fox recognized the part west of the 19th-century plantation known as Peppershells only from an air-photo, for the earthwork has completely disappeared here. 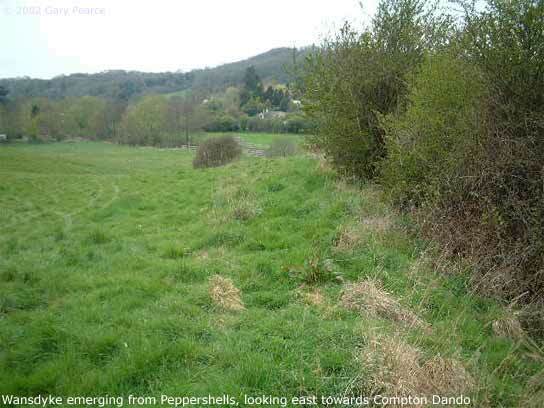 East of Peppershells, the remains have been dropped from the modern Landranger maps, but it is still visible as the pictures below clearly show. Where both Crawford and Fox & Fox noticed a stretch east of the Compton Dando-Keynsham road, this has unfortunately disappeared today below housing. After crossing the river Chew and its floodplain, Wansdyke gloriously reappears in a very straight line of 800 metres (half a mile) towards the Bathford Brook, a tributary to the Chew. 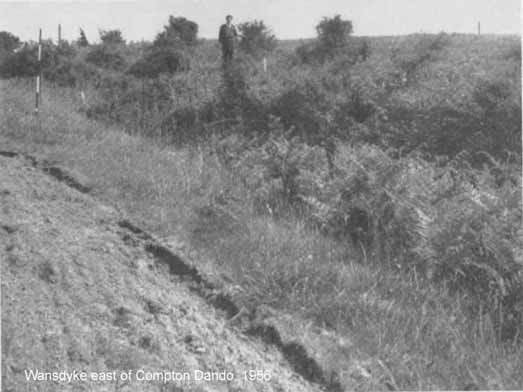 The first part is very well preserved, with the ditch deepened by erosion and a rivulet, as can be seen on the image right, which shows Wansdyke north of New Farm, Compton Dando, in 1956 (click here to enlarge). 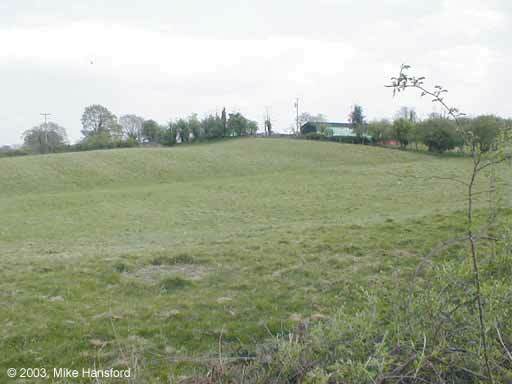 Just before reaching the brook, Wansdyke crosses a field littered with tumuli or burial mounds. Ive seen it at Stantonbury Camp at the junction of the A39 and the Wellsway (grid ref ST670639). At this junction there is a lane that heads off towards Compton Dando and its a few yards down this lane that there is a cottage called Wansdyke Cottage where it can be seen in the garden there. Its even less impressive there than at anywhere else Ive seen it! In fact its more like a small tump on the garden lawn. This small tump, recorded around 1999, was recorded in 1956 by Fox & Fox as a broad ridge, which only shows how fast the deterioration of West Wansdyke proceeds. Wansdyke is completely ploughed out east of the A 39 , where it (once) curved southeast once more to ascend Stantonbury Hill. In 1830, Colt Hoare reported it as climbing across three fields, the last one today covered with trees. 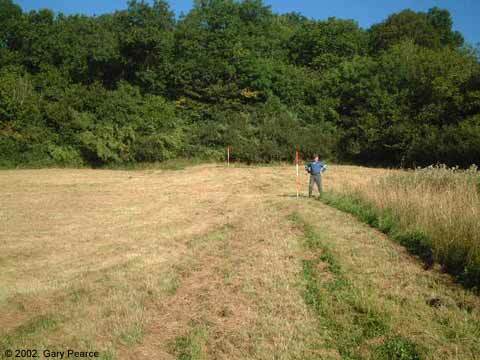 It then reaches the northwest corner of Stantonbury hillfort. A nice shot of the bank, which is mostly hidden from view. Wansdyke close to New Barn Farm, coming down from Maes Knoll and crossing Norton Lane. Looking approximately to the Southeast towards the house. Taken from the A37 in the layby as the A37 rises after coming down from Hursley Hill. same spot, this picture shows Wansdyke 'butted' up to the hedgerow close at the end of the house, it's course being East to West. I think this is the same spot, 2003. 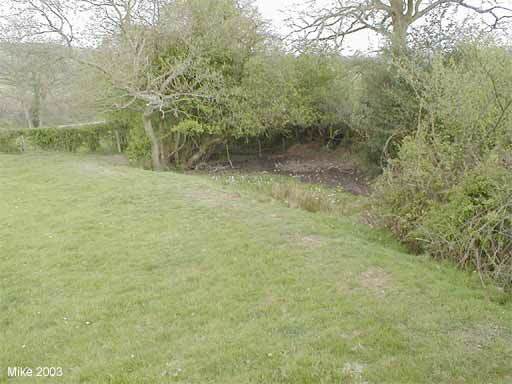 The ditch in this picture is all but gone, silted up and trodden down by cows. This picture is looking East. The bank of Wansdyke is to the right of the picture. 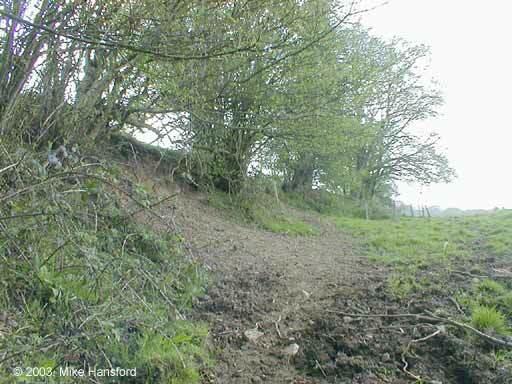 The ditch of Wansdyke is all but filled in by slippage of the bank over 1300 - 1500 years of soil erosion. Looking east. Frost reveals traces.. Publow Hill. West Wansdyke north of Compton Dando, seen emerging from Peppershells Wood. Wansdyke emerging from Peppershells Plantation, summer 2002. Wansdyke seen traversing the recently trimmed meadow. This image is shot from the Compton Dando church tower, looking east to Lye Hill. Wansdyke runs through the middle of the picture. This image shows the same picture, but enlarged. 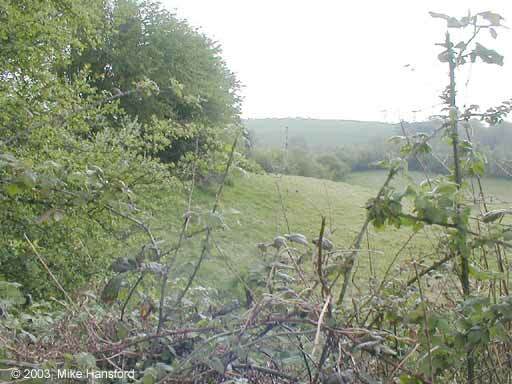 This image shows Wansdyke just east of the River Chew (looking west). This image of Wansdyke north of New Farm, Compton Dando, was shot in 1956 on more or less the same spot. 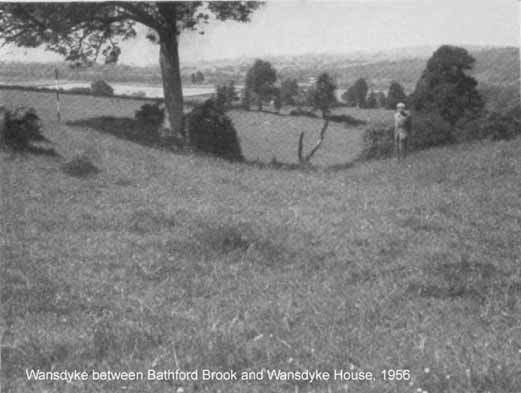 Wansdyke between Bathford Brook and Wansdyke House, 1956. Directions to Section 2 can be found here. Follow Wansdyke further through Section 3. 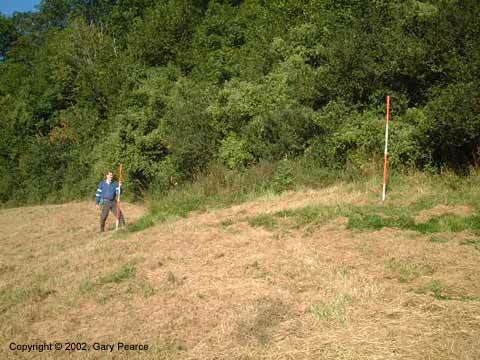 VortigernStudies and Wansdyke Project 21 are copyright � Robert Vermaat 1999-2010.